Friday, November 14, 2014. I wrote the haiku“Flower Pins to My Heart” just this evening after a crazy-busy week filled with all those crazy-working-mommy tasks. I found myself gazing at this shadow box. 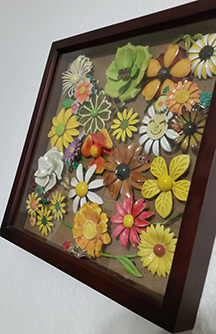 Hand-made by a dear friend, it is filled with enameled flower pins (or brooches as some ladies might say). 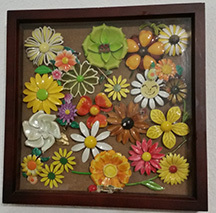 When I look at this bunch of lacquered metal flowers, I remember the many times that we spent combing sidewalk sales and thrift shops in San Francisco looking for some such funky find. It is a no brainer. Hand made. hand written happy birthday cards from my son in his childhood! But of course they would be special and are still in storage among my most cherished memorabilia. I was never one to wear a pin (or brooch). But I do happen to love these kind. I think it reminds me of a certain time (when I was young).